Recently we went out to a restaurant and I had Crispy Skinned Fish with mash and Salsa Verde. It was delicious! Pre-Thermy day’s I probably would have thought about cooking it but now I have and I can! AND It was delicious!!! 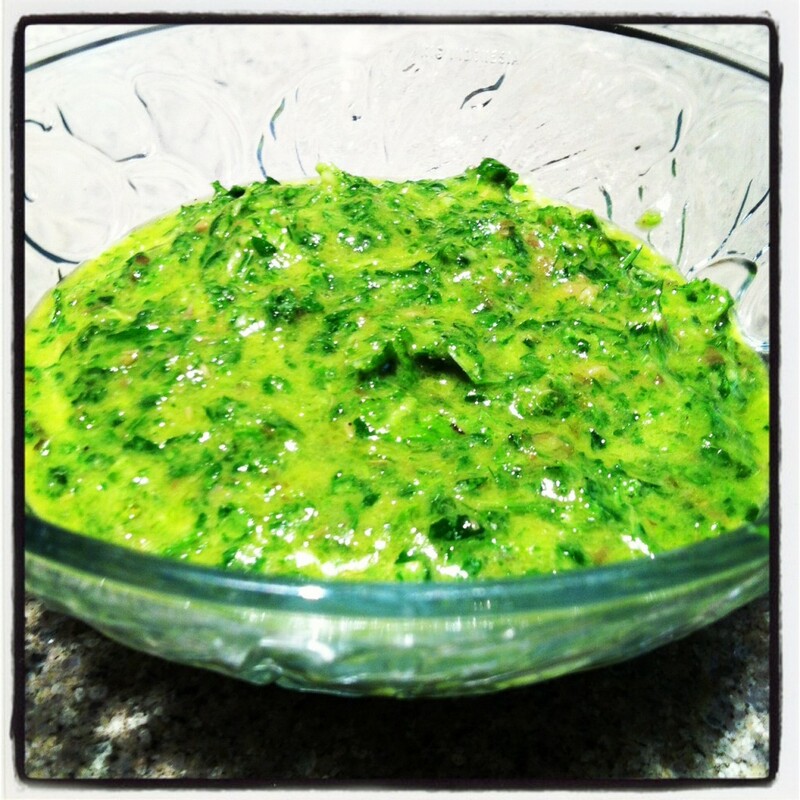 The Salsa Verde is great with fish, it’s a match made in heaven! But it would be great with Lamb too – I also think it would be delicious with scrambled eggs on some sour dough bread or even poached eggs. Toss it with some pasta and some roast chicken or fish and you have a delicious easy lunch or dinner. anyway you get the drift 🙂 It’s great and keep it in the fridge. I am pretty sure it will last a good week in the fridge to be honest mine doesn’t ever last that long 🙂 The recipe is pretty flexible if you not so keen on a particular flavour you can leave it out. My hubby is not so keen on the mint, but I am so next time I might have to leave it out! 1. Add garlic and chop on speed 5 for 4 seconds. 2. Add remaining ingredients and turbo blitz 4 -5 times until desired consistency is reached. You might need to scrape the sides of the bowl to ensure it’s all chopped. 500g Potatoes peeled and cubed. Half bunch of chives chopped. 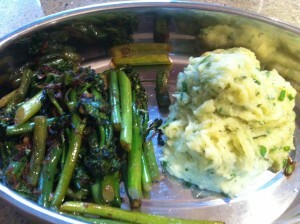 Green Veg or Salad to serve on the side. 1. Peel and Chop Potatoes. Add 1L of water to the TM bowl. Add potatoes to the steaming basket and place inside the TM bowl, Place fish into the Varoma dish and place one teaspoon of the salsa verde on top of each fish fillet. Cook for 22 minutes on Varoma temp Speed 3. 2. Once cooked place fish and potato to the side, discard water and then add the potatoes back to the TM bowl. Add a big dollop of butter, chopped chives and about a tablespoon of salsa verde. Mix on speed 5 for 10 seconds. 3. 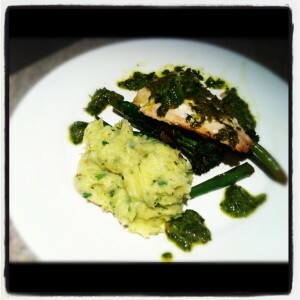 Serve with vegetables or salad, mash and fish, add a spoon full of salsa verde to the plate and there you have it ! Fish with the Salsa Verde ready to steam. If you have fish with the skin on, steam it skin side down and then once it’s steamed put it into a fry pan with a bit of oil or butter skin side down for a minute or two to end up with crispy skinned fish. While my fish and potato was steaming I placed some olive oil, coconut oil in a fry pan, once warm I fried off some garlic and spring onion, then added some brocolini, green beans and cooked it for about 5 minutes so that it al dente, I finished it off with some baby spinach wilted through it. 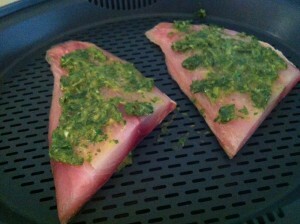 I then cooked the skin side down fish in some coconut oil and olive oil to crisp it up.